Today was the day I finally saw a dermatologist for the first time in my life. 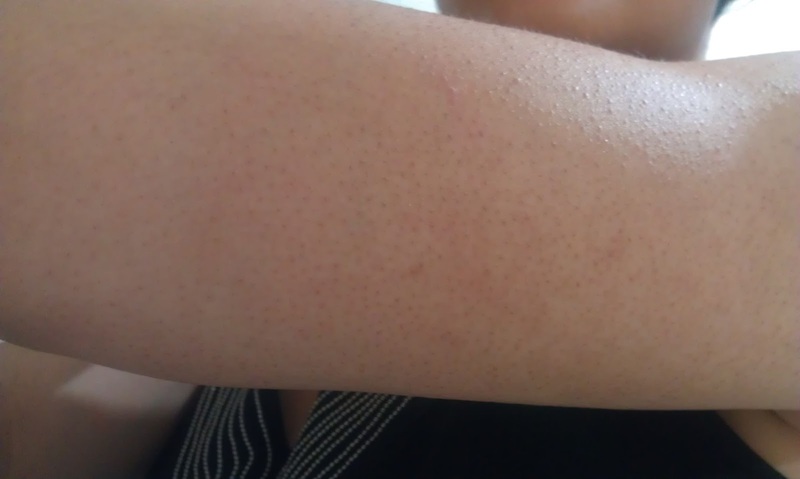 This appointment was made for two reasons: one; the persistent rash on my face/neck/chest that cleared up with steroid cream but always came back, and two; my lifelong skin condition keratosis pilaris (a.k.a hyperkeratosis or chicken skin). 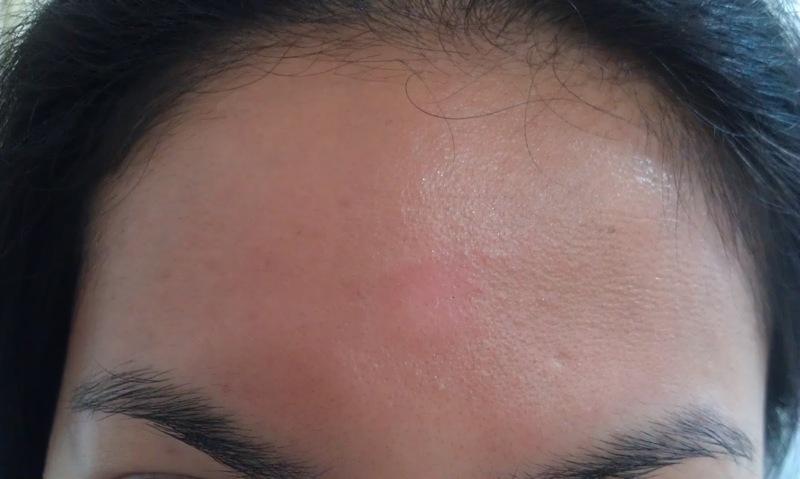 Dry spot on my forehead. 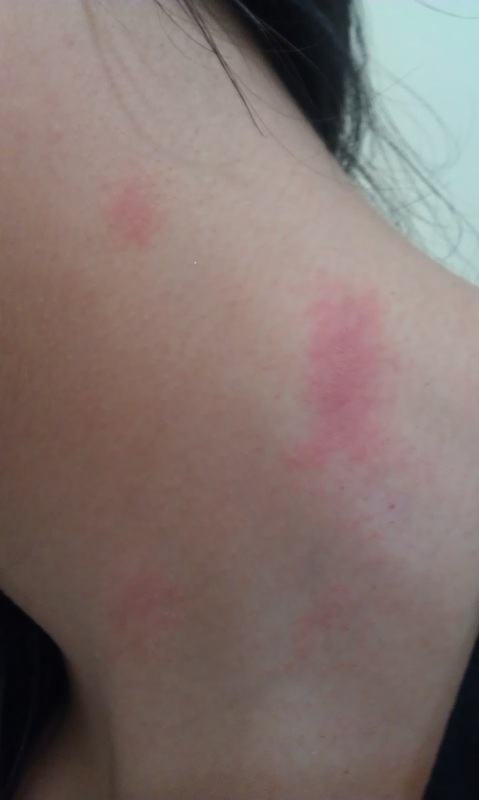 Close up of rash on neck. It itches like crazy! My dermatologist had a look and after a chat, he told me I had eczema. Now, this is news to me because I think my skin is pretty resilient and tolerant to a lot of products. I have experienced rashes on my neck before (always due to perfume or a new shampoo) but it always went away with steroid cream. 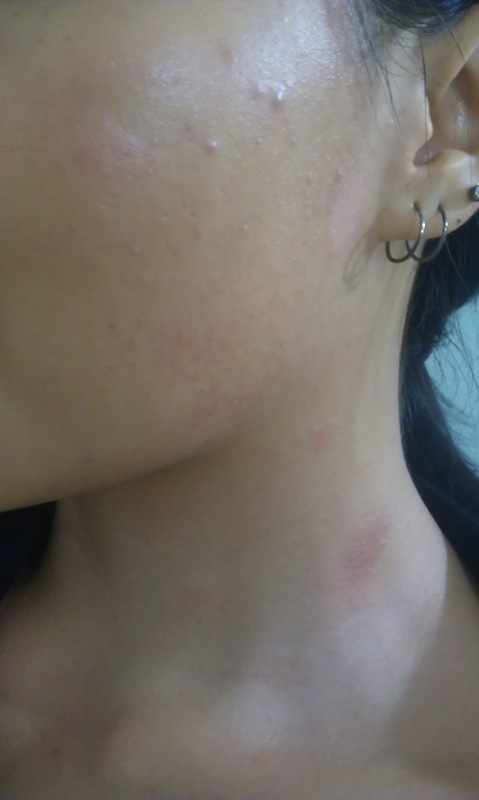 I've also had a really bad rash on my face before which I believe was due to becoming sensitive to steroid cream due to long term use (I had chronic swimmers ear and was using steroid drops in my ear). Every time I saw a doctor about these rashes, they told me it was just a reaction to a product or ingredient. So, when the dermatologist told me I had eczema, I started protesting and saying no, my skin isn't sensitive, to which he replied that it can sometimes be years before you get it. Hmmm! 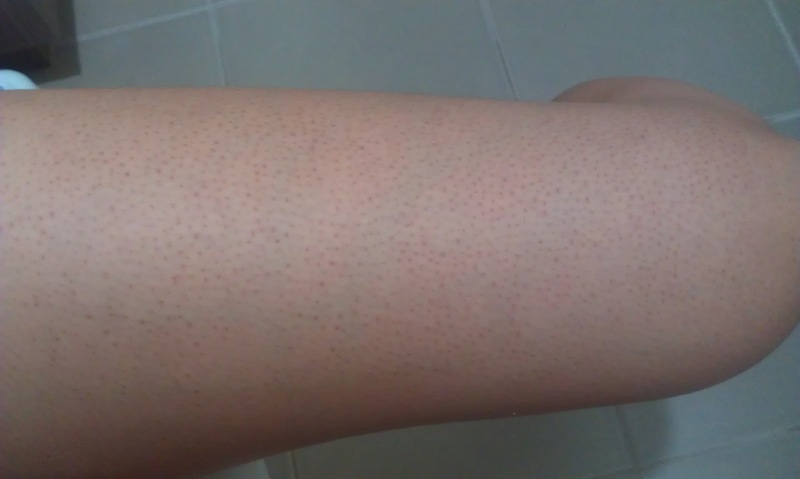 I have been reading a lot of keratosis pilaris forums and the general consensus is that most people with the condition have other skin problems, such as eczema... Ahh, so the puzzle pieces are finally falling into place! The dermatologist has ordered a patch test for me, which unfortunately costs $300 so I have to put together the money before I can get it done at a specialist clinic... *double sigh* But I'm willing to do this, to find out what it is that is causing my skin so much grief. In the meantime however, I am on a skincare buying ban and will only be using what I know will not make my skin break out in a rash. Seeing as rose hip oil is one of the "newest" things I've been using, I'm going to have to say goodbye to it for awhile. I will be using hydro cortisone on any rash NOT on my face if I get a bad flair up, but I will try to avoid this. To treat it naturally, I'll be using good old witch hazel to dry it up and soothe the itch, then using vitamin E oil to moisturise it. That is how I will be dealing with both my body and facial "rash"... (Am I in denial? I refuse to call it eczema!) This won't give me fast results like the steroid cream, but it will benefit me in the long term and be kinder to my skin. And I have done something similar to this to clear up my previous facial rash and it worked, so this should work too. For my kp, my dermatologist was very frank and told me that nothing would really get rid of it or clear it up completely. Cue wrist slashing and wild sobs. Deep down, I knew it anyway because I have pretty much tried everything and nothing has really helped. He did recommend what every other doctor has recommended, though: regular exfoliation and daily moisturising using some kind of AHA or urea. 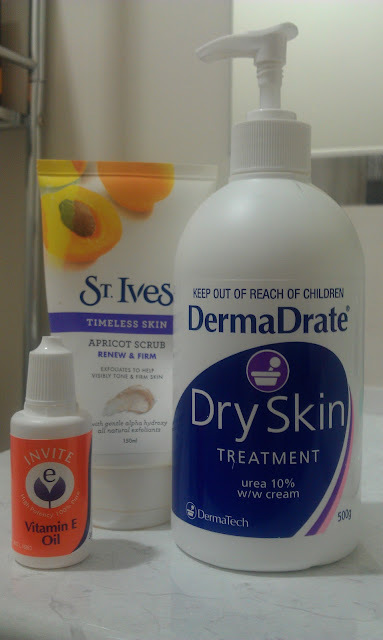 He told me I could go the expensive route; getting regular microdermabrasion or chemical peels from spas or skin clinics and then following up with their pricey maintenance products, or I could just use a chemical exfoliant found in most beauty stores, pharmacies and supermarkets, and use one of the many dry skin moisturisers out there. Kp on lower legs. Looks like I haven't shaved, right? That's because I haven't... lol! But even if I did shave, it still looks spotty like that. Kp on my thighs. So is there any man that would still want me? Hmm... I didn't think so! I'm trying a new cream for my KP too, along with my St Ives scrub. I hope you have luck with what you're doing! I'm with you, I think its a lot of money for some of those KP treatments and if I spent that and it didn't work I'd be pretty annoyed. I don't have the budget to maintain that kind of expensive treatment long term. Interesting what you say about diet making a difference, I did not know that! I wonder if that is something I should try too. I hope that the treatment works for you. I don't have eczema but my son does and his can get all over his body. I'm sure it's an unpleasant feeling. Hang in there hun I'm sure your skin will eventually get well soon! My best friend has the same problem. Chicken skin all over her body but her face is absolutely flawless. I'm exactly the opposite. Life is always balanced out! Your posts are so empowering! I hope your new treatments help!! Dear, we all have some problems with our skin, I had eczema in my arms, neck (become dark), my back legs and no cure found yet,also i have dark spots everywhere any advice. one with the people hit hard with this event. money lending agencies no credit check loans online the finance lease option however caters to your different market entirely. an monthly interest of merely one or 2 percentage points over the prime rate, with all the typical maximum amount borrowed being the lesser of $50,000 or 50% of one's vested 401k account balance. The Hiya Cat selection of cycles aside from provides Laid-back operating variation brazilian hair involving functionality journeying. Your short time luggage let it look from the Olympics when quickly. Your fashion usually takes straight into count number anything using the stage that convincing girls along with young ladies. Your seating are generally easy, cushioned along with facet hi there cat. Your figure can be minimal along with the reasons like it happens to be stress-free for you to understanding in along with inedible along with the young ladies don’t ought to transfer his or her support for the seats just as if hanging a new line. They might only go throughout just as if receiving about the motorcycle. The way to find with no difficulties many aesthetic accessories employing the purpose of girls along with young ladies will surely have unique variations of your motorcycle more popular. You can find Hi there Kitten headlamps, Hi there Kitten locks, Hi there Kitten variety organizations, Hiya Cat athletics steady stream package, Hi there Cat side protections, Hi there Kitten part insures, Hiya Cat mudguards, Hiya Cat motorcycle helmet, Hiya Cat automobile, Hiya Cat the front transfer reduce handbag as well as your short time luggage along with small position your current brand along intended for, Hi there Cat recognize dish, Hi there Kitten graphics, Hi there Kitten athletics jacket, Hiya Cat motorcycle operating streamlined t-shirt, Hi there Kitten leg shields. Your activist supporter young lady in addition inflated every single one legitimate shuffle involving your ex bi-cycle using Swarovski Tissue. Block creed incorporates a with no difficulties brazilian hair uk this means. Only pimp your Hi there Cat motorcycle for ones hearts and minds ask.